"OMG, I Have Cancer. What Do I Do Now????" "Tried and true" resources from a longtime oncology (aka cancer) nurse, who is tired of wading through bogus and unusable websites, looking for help for the cancer patients she loves. For full information about Port-a-caths, see the links below. There is plenty of information already out there about ports, so I won't reinvent the wheel. 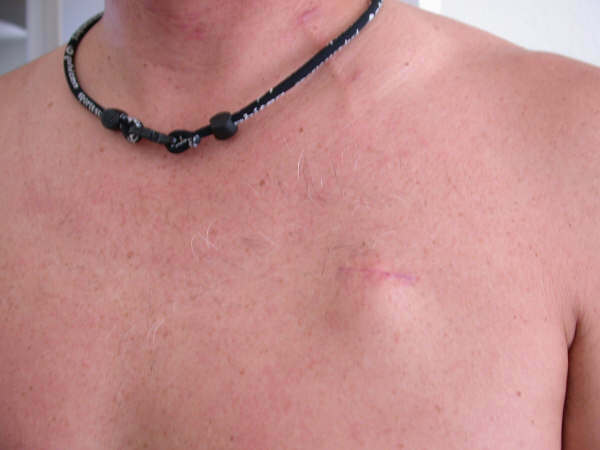 I will write about what I think are some of the major points of having a Port-a-cath (aka "port"). What is the #1 question cancer patients want to know about Port-a-caths? They want to know what it looks like when it has been inserted into a real human being (see photos below). What is it? 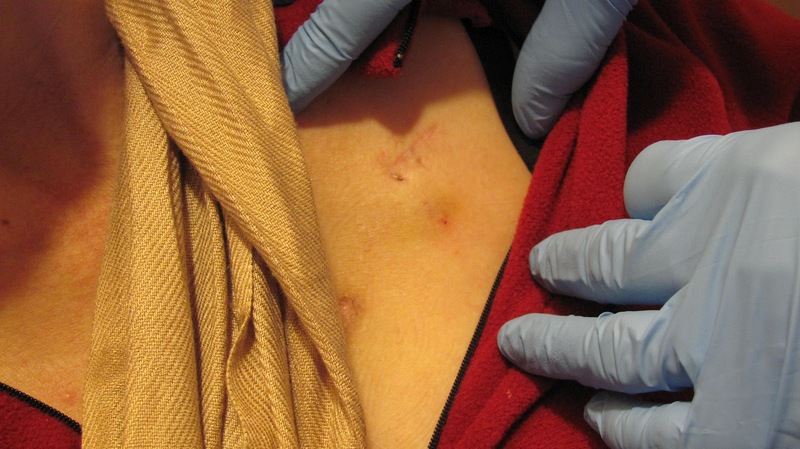 It is a "venous access device" or an implantable device attached to a catheter that sits under your skin. The catheter part is threaded through one of your major veins and it kind of "hangs" in the top part of your superior vena cava. We give chemo through it (or IV fluid, or blood, or TPN). Instead of giving a boatload of stuff through one small vein in your arm at a lower rate that will take forever, we can give it in a port that flows into a bigger "vein or vessel". A lame analogy? If you have a little tiny pipe that drains your sink, then it will take longer to empty out your sink. If you have a large, open pipe, the water in the sink will drain quickly. Some types of chemotherapy are especially toxic. That's good for attacking cancer cells, but hard on your healthy tissue. Chemo can damage the healthy skin and arm tissue if it is running through an IV that becomes dislodged out of a vein (can happen with movement of your arm). 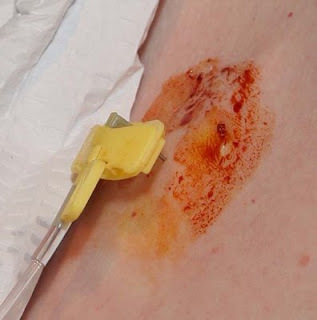 This causes it to leak out of a "normal" arm IV site or vein into the healthy adjacent skin. With a port, we don't have to worry about this. 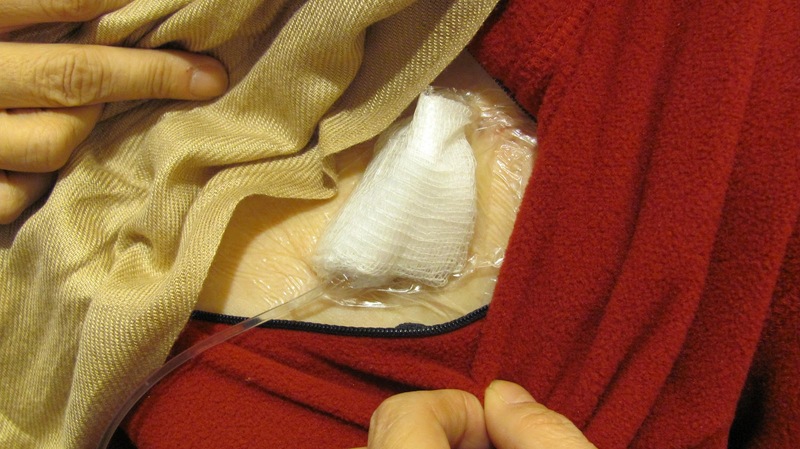 The port is sutured in place and "buried" under a little pocket of skin to hold it securely. The catheter part goes into a large vein. Why do I need it? We can draw blood out of it, and infuse chemo, blood products, IV fluid into it with just one needle stick. Even if you have great veins or "pipes" (as we say in the business), if you need chemo for 6 months or 1 year, we are going to "use up" some of your veins. Each time you visit us, we might have to hunt for decent IV sites, apply heat and "stick" your arm 2 or 3 times before we can find a vein. As you can imagine, none of this is fun. It is actually painful and upsetting. Multiply those numbers by many clinic visits throughout the year, and now you know why it might be beneficial to have a port placed. A port can become your best friend. Nobody is excited about getting one, but once you have one, you will be grateful that you had it inserted. Here's what a port looks like by itself. Out of the box. Not in a human. The two on the left are single lumens and the two on the right are double lumens (single barrel or double barrel!!). 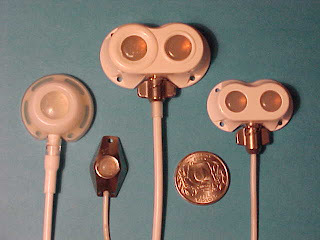 On the double lumen, even though it looks like they have 2 "heads" and only one "tail", there are actually 2 tails inside the long catheter. They might put a double lumen in if you are going to get a "big guns " chemo regimen or bone marrow/stem cell transplant. These are regimens that typically have several different types of chemo to give. There are treatments that require you to get 2 infusions at one time (one type of chemo in one side and one in the other side). Or you might get chemo in one side and IV fluid in the other side. Or you might need one side to infuse blood products or IV antibiotics, and one to infuse TPN (Total Parenteral Nutrition aka "IV Food in a Bag"). There are even triple lumens. Basically the port is a surgical steel "metal" device with a rubber stopper covering it, with plastic or silicone surrounding it. 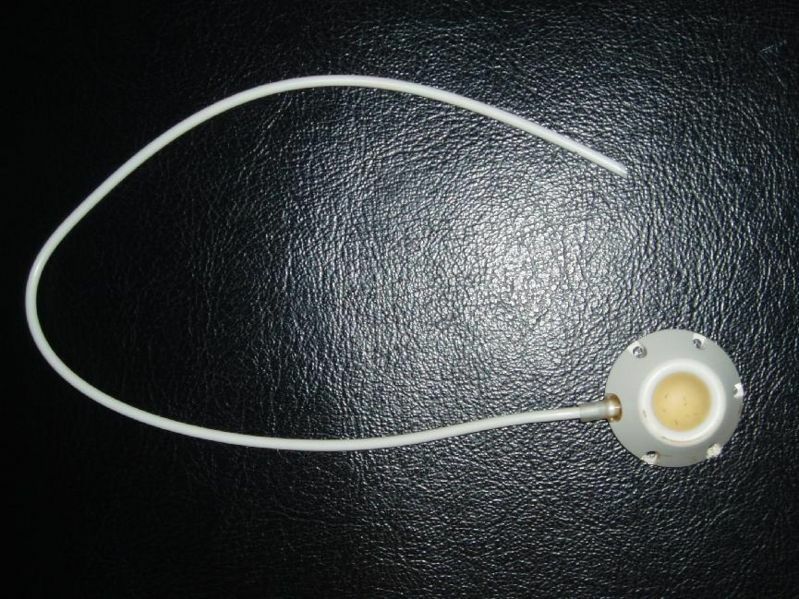 Here's another angle of the device without the catheter or "tail" attached to it. 1) To "access' the port, the nurse first looks for "your bump". She then cleans the site with antiseptic solution (The port lies flat under the skin, is attached to the catheter that goes into your large blood vessel). 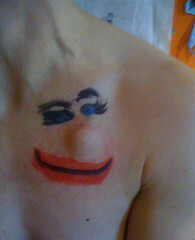 2) The nurse will feel around your skin until she locates the port. She will then hold it steady between her fingers with one hand, and with the other hand she will take a hook shaped needle and will stick the needle into the rubber "stopper" area on the top of the port. She will do this quickly in one motion as if she is playing darts. The quicker she does it the less it hurts. 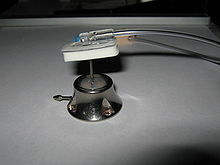 She can "feel" the needle go through the rubber stopper and she can "feel" it if the needle hits the metal base below. 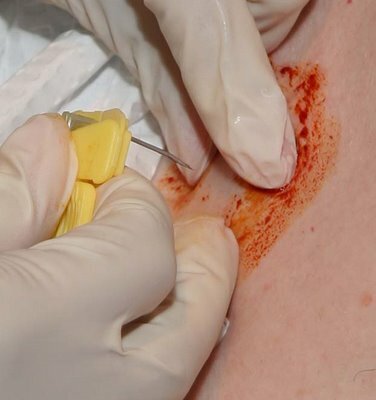 The orange stuff you see is antiseptic/betadine not blood, so don't get skeeved out by it! Actual port "bump" of "Dee-Hee" a fabulous, gorgeous ovarian cancer patient who agreed to let me take this photo!!! Thank you Dee-Hee!!! Here's the antiseptic that has been rubbed on the port site. The nurse steadies the port between 2 fingers of one hand. 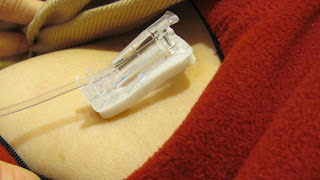 With her other hand she uses the hook shaped needle to access the port. She will attach a syringe, will pull back on it and make sure she can get a good blood flow. Once she has, she will tether the needle down with plastic occlusive film and tape to hold it in place. 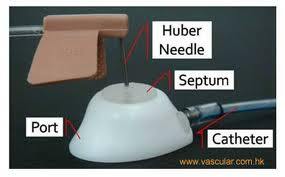 Huber needle with foam pad, attached to IV catheter tube. Dee Hee's port with plastic wrap over the "Emla" numbing cream. One stick. Blood comes out and goes to lab to be tested (where they check your blood counts). IV fluid and chemo go in. 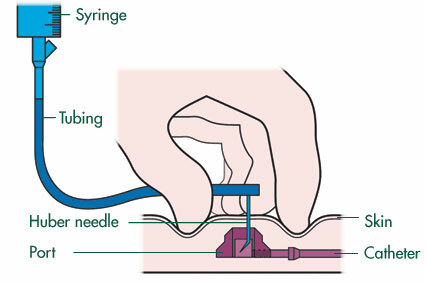 At the end of the session, the needle is removed and you go on your way. Once the insertion incision is healed (7 to 10 days after it is inserted), you can swim, bathe with it, leave it uncovered and open to air. It needs to be flushed once a month with a heparin (aka blood thinner) solution to keep it patent. If you are going 3 months until your next MD visit, remember that you will need appointments booked monthly for your nurse to do a quick "flush". You can get "Emla Cream", which is an anesthetic cream that you put on your skin (with a piece of saran wrap or plastic covering that your nurse will give you) over it. Put this on when you leave your house and then 1 hour later when you are sitting in the clinic it will have numbed up your skin a bit and will ease the discomfort of putting a large needle through it. Tell the radiology folks that you have it if you are going for an MRI or scan. If you are going through security at the airport, you had best tell the security folks too. You will get a card to carry in your wallet with basic info about your port. Here are some good websites that give an overview and explain how ports are inserted. 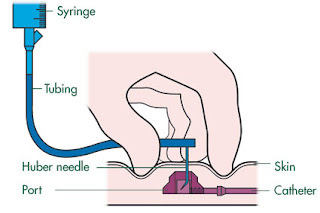 If you are a patient or family member, I beg you not to watch any of the "port insertion" videos on YouTube that show you the actual insertion. These are meant for instruction for placement and are disturbing to look at unless you are into Operating Room surgeries and dig that kind of thing. Remember....the port is very useful during chemo. But as with all of chemo side effects, your port is only taking up rental space on your chest temporarily. It will be removed after chemo is finished (when you and your doctor decide when you want it removed). Thank you so much for this resource. It's really helped ease some of the fear and anxiety I have going into this pretty scary journey. Thanks for reading!! Wishing you all the best!! If you have cancer, you have probably already waded through more websites than you care to count. Most likely, you have found a few really great ones and many that are repetitive time wasters. If you have cancer, you have already spent WAY too much of your time at doctors' appointments and clinic visits. Instead of spending your time wading through cancer websites, my wish for you is to be out spending time LIVING YOUR LIFE!!! As a longtime oncology nurse, I (and my fabulous nurse, md, patient navigator, social worker colleagues) have spent a lot of time searching for resources so that we can help our patients and their families. My goal for this blog is to share the "tried and true" useful hints and suggestions that we have learned with you to hopefully help make your cancer journey easier. If you are a cancer survivor or a loved one of a cancer patient and have found a good link or resource, please come back and post it here!!! If you are an oncology nurse or health professional with a good, concrete, realistic resource to share, please post it here!!! 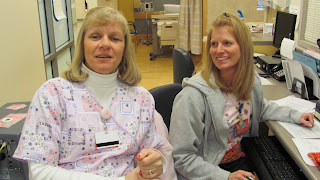 Being an oncology nurse has changed my life. My patients and their families have honored me by allowing me to share a little of their journey, and I am forever grateful to them for this. I definitely have learned more from them then they have learned from me. Cancer patients have taught me about what is truly important in life. They also have taught me that we still have a long way to go as health care professionals to help make their cancer journeys easier. Here are some hints, suggestions, resources, links that my patients, my colleagues and I have found to be helpful. I hope that they will help you too!! One more thing....I've been told that I need a "disclaimer". So, the opinions, thoughts, ideas, and basically anything written on this blog are only the thoughts, opinions, ideas, suggestions from me, some of my great colleagues, and our very wise patients. They do not reflect the opinions of the institution that I work for. They aren't meant to replace your own wonderful doctors' and nurses' suggestions. When in doubt, always discuss your issues with your own doctors and nurses. Thanks for checking out my blog!!! Elizabeth Grady Schools and the Great Faculty/staff that work there. Health Thyself LLC- Suzanne Brownell, Awesome trainer, zumba, tai chi, nutrition specialist!!! Mike's Page one of my favorite websites about Melanoma. Pete Tustison has devoted his life to this and he is awesome!!! Ripley Greene Dr. Cathy Ripley Greene Chiropractor, Wellness, Tong Ren and a whole lot more!! The Sam Fund for Young Adult Cancer Survivors (under age 35, scholarships, assistance with rent, medical bills). Mercy Flight Indiana Kay and Jim Butler, Thank you!!! !